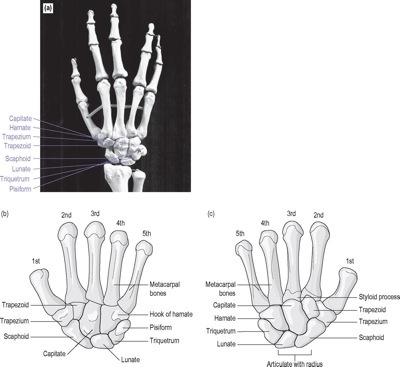 (a)carpal and metacarpal bones of the left hand; (b) palmar aspect; (c) dorsal aspect. If the wrist and hand are the source of the patient's symptoms, hand functions will be compromised or restricted by pain, stiffness, protective spasm or other associated signs such as weakness, pain inhibition or loss of feeling. Prehensile functions which may be compromised include forearm twisting (pronation, supination), wrist flexion, extension, ulnar and radial deviation, the function of opposition and manipulative or gripping activities; non-prehensile functions which may be compromised include pushing, pulling or weight-bearing activities. The stage of the disorder and the severity and irritability of the symptoms will determine the degree of impairment experienced by the patient. For example, a patient who has a 1-week history of a badly sprained wrist will use the hand less than someone with stiffness 12 weeks after a Colles fracture. • Identification of signs of movement impairment (temperature changes, excessive sweating, soft tissue changes including swelling and soft tissue thickening, bony abnormalities such as exostosis). • Palpation of the median, ulnar and radial nerves around the wrist and hand for mechanosensitivity, symptom reproduction and signs of swelling or thickening. • Palpate tendons and tendon sheaths where tenosynovitis may be evident (extensor pollicis longus in particular). To localize the pathology, consideration must be given to the joint above and below. Elbow: Have patient flex elbows and apply overpressure. Have patient extend elbow with overpressure. Active movements should be performed by the patients in addition to overpressure provided by the physical therapists. The motions below should be considered for active movements. Strength of the muscles around the wrist must be assessed in the radiocarpal exam. 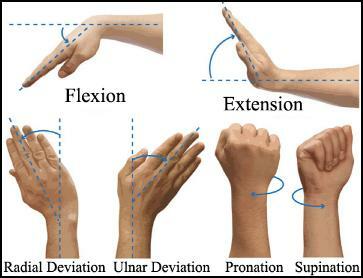 Wrist Flexion-the patient actively flexes the wrist. The therapist can resits wrist flexion and grade the patient's strength from 1-5. Wrist Extension-the patient actively extends the wrist and then the therapist can resist the extension. Ulnar deviation-the patient actively ulnar deviates and then the therapist resists the motion. Radial deviation-the patient radial deviates and then the therapist resists the motion. Supination-the patient supinates and then the therapist resists the motion. Pronation-the patient pronates and then the therapist resists the motion. If a difference was noted with the active movements, passive movements would need to be assessed. If the passive movements shown below are not normal, then a goniometer should be used to document the range of motion deficit. The examiner holds the patient's wrist flexed and asks the patient to actively extend fingers against resitance. Pain would indicate a postive test for radiocarpal or mid-carpal instability, scaphoid instability, or inflammation. The patient sits with the elbow resting on the table and forearm pronated. The examiner faces the patient. With one hand, the examiner takes the patient's wrist into full ulnar deviation and slight extension while holding the metacarpals. The examiner presses the thumb of the other hand against the distal pole of the scaphoid on the palmar side to prevent it from moving toward the palm while fingers provide a counter pressure on the dorsum of the forearm. With the first hand, the examiner radially deviates and slightly flexes the patients hand while maintaining pressure on the scaphoid. This creates a subluxation stress if the scaphoid is unstable. A positive test would be pain or a thunk sound. The patient sits and the examiner holds the patient's wrist with one hand so that the thumb applies pressure over the distal pole of the scaphoid. The patient then attempts to radially deviate the wrist. Normally, the patient is unable to deviate the wrist. If excessive laxity is present, the scapoid is forced dorsally out of the scaphoid fossa creating a clunk noise or pain. This test is used to determine the integrity of the lunotriquetral ligament. The examiner grasps the triguetrum between the thumb and second finger of one hand and the lunate with the thumb and second finger of the other hand. The examiner then moves the lunate up and down, nothing any laxity, crepitus, or pain, which indicates a positive test for lunotriquetral instability. The patient is asked to make a fist. 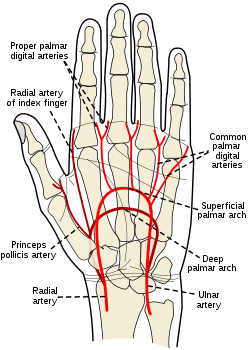 If the head of the third metacarpal is level with the second and fourth metacarpals, the sign is positie an dindicative or a lunate dislocation. The patient makes a fist with the thumb inside the fingers. The examiner stabilizes teh forearm and deviates the wrist toward the ulnar side. A positive test indicated by pain over the abductor pollicis longus and extensor pollicis brevis tendons at the wrist and is indicative of a paratenonitis of these two tendons. The examiner taps over the carpal tunnel at the wrist. A positive test causes tingling or paresthesia into the thumb, index finer, and middle and lateral half of the ring finger (median nerve distribution). The examiner flexes the patient's wrists maximally and holds this position for 1 minutes by pushing the patient's wrists together. A positive sign is indicated by tingling in the thumb, index finer, and middle and lateral half of the ring finger, which indicates carpal tunnel syndrome. If the patient is complaining of tingling/numbness/sensations into the distal upper extremities, a neurological exam should be performed. The dermatomal patterns can be traced with an object to determine if the patient feels the same sense of touch on both sides. A myotome screen can be performed as part of the neurological exam in order to test strengths of those upper extremity muscles supplied by cervical nerve roots. The Biceps(C5) and Triceps(C7) tendon reflexes can be tested for those patients that require a full neurological exam. 1. Hengeveld E, Banks K, eds. Maitland's peripheral manipulation. 4th ed. London, England: Elsevier; 2011. 2. Magee D, ed. Orthopedic physical assessment. 5th ed. St. Louis, MO: Saunders Elsevier; 2008. 3. Hislop, H.,Montgomery, J., ed. Muscle testing: Techniques of manual examination. 8th ed. St. Louis, MO: Saunders Elsevier; 2007. 4. Reese N, Bandy W, eds. Joint range of motion and muscle length testing. 2nd ed. St. Louis, MO: Saunders Elsevier; 2010.